Some of the world's greatest cities during the Middle Ages were on the eastern coast of Africa. Their ornate stone domes and soaring walls, made with ocean corals and painted a brilliant white, were wonders to the traders that visited them from Asia, the Middle East, and Europe. They were the superpowers of the Swahili Coast, and they've long been misunderstood by archaeologists. It's only recently that researchers outside Africa are beginning to appreciate their importance. Throughout the Middle Ages, great civilizations ringed the Indian Ocean. From Egypt, people could travel the Red Sea to reach the ocean, then sail south to Africa, or continue east to the Arab world and India. Then, of course, one could travel over land on the famous Silk Road from India through central Asia and into China. In reality, few people ever made that journey. But many trade goods did, passed from hand to hand in cosmopolitan cities whose cultural diversity would have made places like New York and Sao Paolo look like monocultures. Among those great medieval cities were places like Songo Mnara, a gorgeous and bustling Swahili city built on an island off the coast of Tanzania in the fourteenth century. At a time when European cities were getting wiped out by plagues and famines, Songo Mnara was thriving. From the tenth to fifteenth centuries, the riches of Africa's interior, such as ivory, gold, resins, food, timber, and even slaves, were in high demand around the world. Because of the monsoon trade winds, which could reliably bring traders from around the Indian Ocean to and from the East African coast, many of these goods passed through Swahili towns and into a hemisphere-spanning trade network—through the Red and Mediterranean Seas to Europe, across the ocean to India and Persia, and to China via sea and land. Some of the Swahili stone towns—a collective description of some settlements with stone ruins across miles of coast—grew spectacularly wealthy on this trade. They were independently ruled sultanates that shared intracoastal trade, culture, language (Kiswahili), religion (Islam), and receptiveness to the influence of the outside world. Like the independent city-states of the same period in Italian history, some were major powers, and their fortunes rose and fell with shifting trade relationships and political maneuvering. Today, Songo Mnara is a ruin that had been almost forgotten by people living outside the local area. 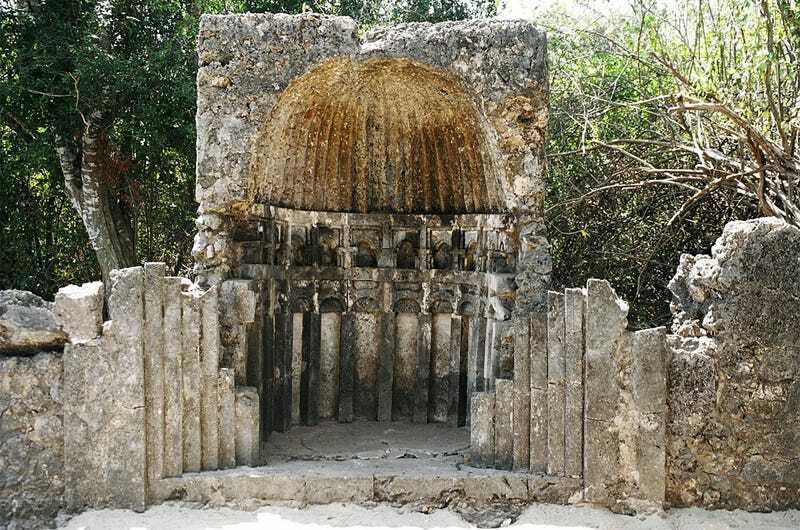 It was built by the people of Kilwa Kisiwanti, an ancient city on a nearby island, and they did it the way today's best city planners might. Though no one is sure why, they wanted to erect this city quickly. So they drew up a city plan and organized the homes, palace, and town's mosques around graceful open areas, with generously-sized courtyards that the locals used to greet traveling merchants. Swahili towns didn't have marketplaces like comparable cities in Europe, the Middle East and China. Instead, archaeologists are learning, trade was conducted in the courtyards, which were halfway between public and private space. Similar kinds of public/private areas were common in ancient Rome as well. Perhaps merchants would stay with a family and other city dwellers would visit to trade with them. Or perhaps they would travel from courtyard to courtyard, offering their wares. 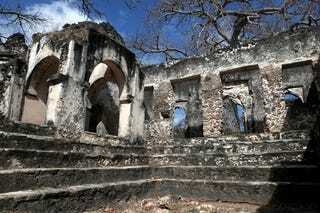 The people who lived in Songo Mnara were part of a Sultanate, or city-state, connected to their parent city of Kilwa. They spoke Kiswahili (related to today's Swahili), and were part of an enormous cultural network that spanned the coast from Somalia to Tanzania. Like the Arab peoples they traded with, the people of the Swahili Coast were Muslims and some of their most breathtaking architecture can be seen in the towers that crown their mosques. Below, you can see the octagonal pool that once was a gorgeous water feature in the Sultan's palace on Kilwa. According to one of the archaeologists who is now excavating Songo Mnara, University of York archaeologist Stephanie Wynne-Jones, it's very possible that Islamic practices in medieval Songo Mnara were different from the ones popular in the same region today. According to ethnographic research, Swahili society is traditionally matrilocal (meaning that a man, after marriage, moves in with his wife's family), which doesn't seem to jibe with the more socially conservative form of Islam practiced on the Swahili Coast today. It is thought that the later Omani occupation of the region imposed a stricter version of Islam with regard to women, overwriting what could have been a brand of Swahili Islam with greater gender equality. One of the key pieces of evidence for this earlier form of Islam can be found on Songo Mnara, where University of Bristol archaeologist Mark Horton believes he's uncovered a mosque that was purpose-built for women. Horton is an expert on mosque architecture and believes that such a mosque would be unique in the Islamic world and would have reflected the importance of women in Swahili society of the middle ages. It's possible that women prayed alongside the men in the many other mosques of the town, and eventually were segregated into their own mosque as their roles changed over time. We don't know for sure, and Horton says that it's always possible that the building was for some other purpose — perhaps a Koranic school — they still haven't figured out yet. Below, the ruin of the possible women's mosque. Below that, we can see an excavation area where houses once were. 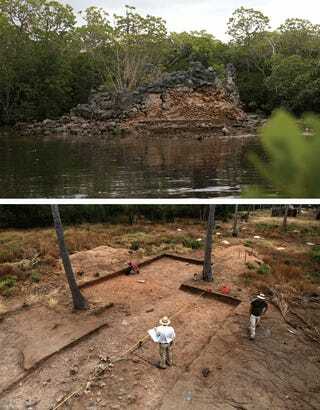 For Horton and Wynne-Jones, excavating Songo Mnara is a rare privilege — it's a mostly-undisturbed site, largely ignored by scientists and locals alike. Partly, it's been preserved so well because archaeologists from an earlier era didn't believe it was a legitimate African ruin — they believed the architecture was too sophisticated, and therefore had to have been crafted by Arab traders who wanted an outpost. That idea has long been disproven, and now the archaeological community accepts that the vibrant Swahili culture was purely African in origin, and that the cultural influences from the Middle East cut both ways. The Swahili Coast and its luxurious arts and goods were an enormous influence on their neighbors ringing the Indian Ocean. At the end of the fifteenth century, the Portuguese arrived and Indian Ocean trade changed. Many stone towns were abandoned around this time, often hastily. Through the ensuing 500 years of colonial occupation—Portuguese, Omani, British—the Swahili culture that coalesced in the medieval period has persisted. Today, more than a million people in East Africa still identify as Swahili (from Sawahil, an Arabic word meaning "people of the coast"). Below is a drawing of Kilwa from a European map drawn in the sixteenth century, roughly a century after the city's heyday as a trade power. Admiration for the city's beauty had spread far and wide. And, as the survival of Swahili culture in Africa attests, the memory of the great trade empire lives on in the peoples of the region. Now, as archaeologists learn more about this history, it's becoming more obvious than ever how crucial African civilizations were to the development of the medieval world.